Bistro To Go is a quainty little stop along East Ohio street in Pittsburgh’s northside. Its popularity is evident by the crowds that I see walking in and out on a cold winter’s day. Each weekday has several different featured hot lunch specials which are displayed in a display case upon entering. Today, despite the cold, I opted for some bistro specialties. Much like other popular chain bistros, like Panera Bread, Bistro To Go offers a “Pick a Pair” option, where you have a choice of half a sandwich, half a salad or a cup of soup. For lunch today, I opted for a Pick a Pair of “Mr. 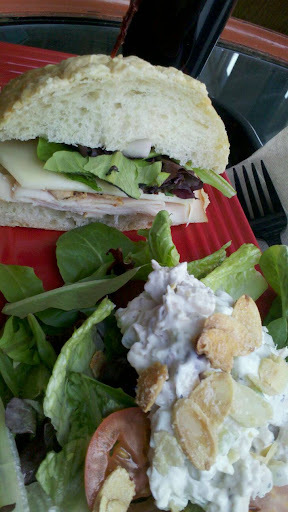 Pepper” Bistro Sandwich and the “Cranberry Almond Chicken Salad” served over a bed of greens. The lunch satistifed my lunch hunger and hit many of my top taste profiles. The Mr. Pepper sandwich tastes nothing like its cousin Dr. Pepper. It is a turkey and peppered bacon sandwich with onion, provolone cheese, roasted tomatoes, spring mix lettuce with balsamic vinegar on a three cheese roll. The peppered bacon shines through on the sandwich. The use of a spring mix over traditional iceburg lettuce was a nice touch. I didn’t taste much of the balsamic, though it must have been there because the sandwich wasn’t dry. Overall, it was good, though I would have preferred a softer bread around this sandwich. For the salad, I very much enjoyed this creamy chicken salad over the bed of greens. The ultimate ingredient, though, were the almonds. After having this salad, I am adding toasted, sugared almonds to my list of favorite salad toppings – also on the list is bacon bits, and warm raisins. Last night we had a snowstorm, which one Tweeter, @BoringPGH, coined as the SNOWtoriousBIG. Today, as I take my car to Lockhart Tires for new tires to navigate the snowy roads. What better way to spend an hour than stopping by the Bistro for lunch. I think the Priory Fine Pastries is in order for dessert!